Meeting of the IX Executive Committee of the Prince of Girona Foundation. May 2012, Royal Palace of El Pardo. 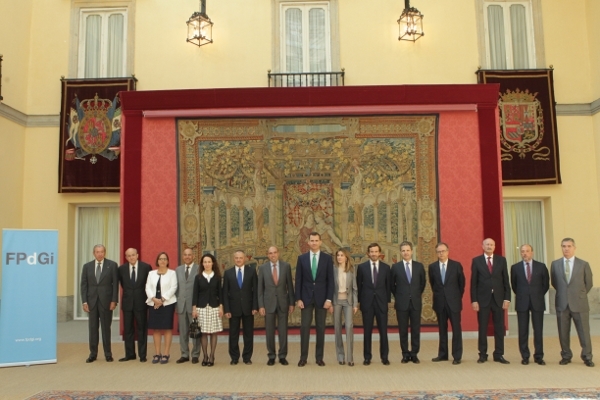 On May 18 Don Felipe and Doña Letizia hosted the meeting of the IX Executive Committee of the Prince of Girona Foundation at the Royal Palace of El Pardo, Madrid. The Prince of Asturias and Girona is the honorary president of the Foundation. « Delivery of the Caja Madrid Scholarships for graduate studies abroad. May 2012, Madrid.